alaTest har samlet og analyseret 586 anmeldelser fra magasiner og hjemmesider. Anmeldere kan virkelig godt lide størrelsen. Også præstationen imponerer, men folk er mindre positive med hensyn til zoomen. Vi analyserede bruger- og ekspertratings, produktalder og andre faktorer. Sammenlignet med andre Videokameraer får Ricoh Theta S en samlet alaScore™ på 95/100 = Fremragende kvalitet. Ricoh's Theta S is the simplest and most elegant 360 cam you can buy. The Ricoh Theta S provides decent 360 photos and acceptable 360 video for early adopters, but it’s likely to be superseded soon. 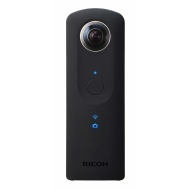 The Ricoh Theta S is a solid 360-degree camera for capturing still images and smooth video. It might not be the absolute future of photography, but this point-and-shoot 360 camera is damn cool. Whether you're looking to create content for your VR headset or just love cool camera gadgetry, the Ricoh Theta S is an excellent way to start creating spherical images. The sci-fi-looking camera can capture panoramic photos in a single shot as well as video that can be endlessly manipulated with your fingertips on your iOS or Android device. After 30 hours of research and hands-on testing, the Ricoh Theta S is the best camera for most people who want to create 360-degree stills and video.